Irene Tinagli is a member of the Italian Parliament (Chamber of Deputies) and a member of the Standing Committee on Labor. Prior to her appointment, she was an Assistant Professor of Management at University Carlos III in Madrid – from which she is currently on leave of absence. 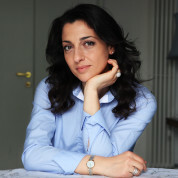 She received her PhD and her Master of Science in Public Policy and Management from Carnegie Mellon University, and has served as consultant for the European Commission, for the Department of Social and Economic Affairs of the United Nations and various national and regional governments and agencies. She’s also been a columnist for the Italian newspaper La Stampa and a contributor to other national and international newspapers. On March 2010 she was appointed Young Global Leader by the World Economic Forum.